I am not talking about the lines on the heads of bolts that indicate what Grade the fastener is. I am talking about the letters, numbers, and symbols. 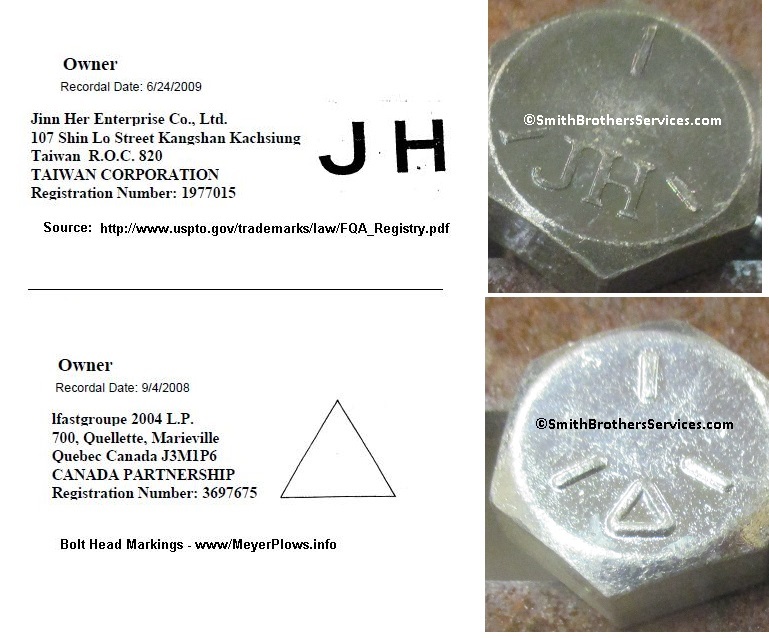 There is a link on this page that will take you to (a document on) the US Patent & Trademark Office where you can download the file and look at all the various markings and where the bolts are made. It seems the most common marking we se these days is JH. Meyer uses them in all their Mounting Carton, PAF Carton, Hydraulic Carton, and CLF Carton hardware kits, Western uses them too. Tractor Supply Co sells them by the pound. 2017 - Well we have much more to add now. 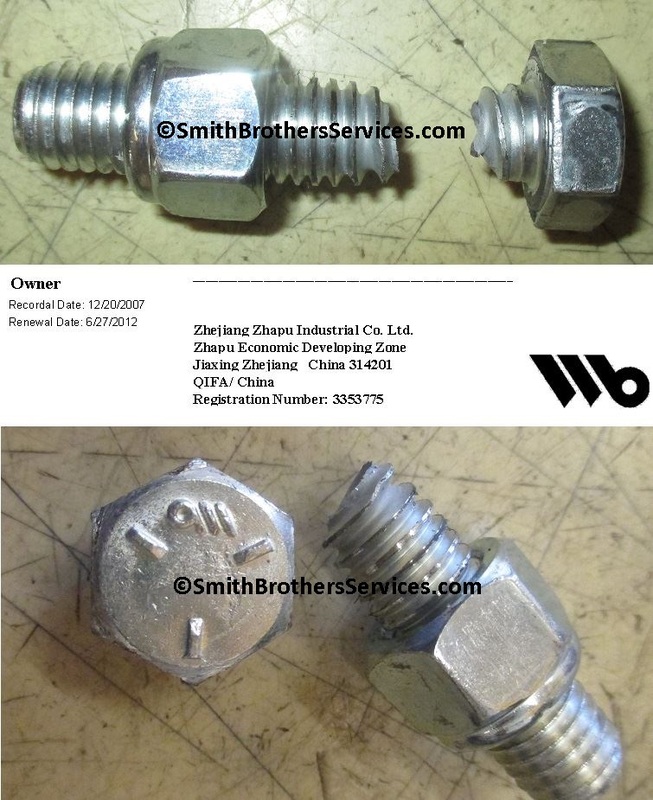 It seems we are finding more of a variety of China or Taiwan bolts now in OEM hardware kits. I guess they found an even cheaper source. Lets be honest, they would not switch vendors to pay more, and if they wanted to ensure real quality, they would not be sourcing hardware in China and Taiwan in the first place, now would they? In their (somewhat) defense, it is very common today for manufacturers to find cheaper materials, rather than raise their prices. Some do both, but cheaper materials is a "behind the scenes" endeavor. use in the shop, the triangle on the head, in the package marked "Made in Canada". Another we have seen, has JDF on the head. It too is made in China. 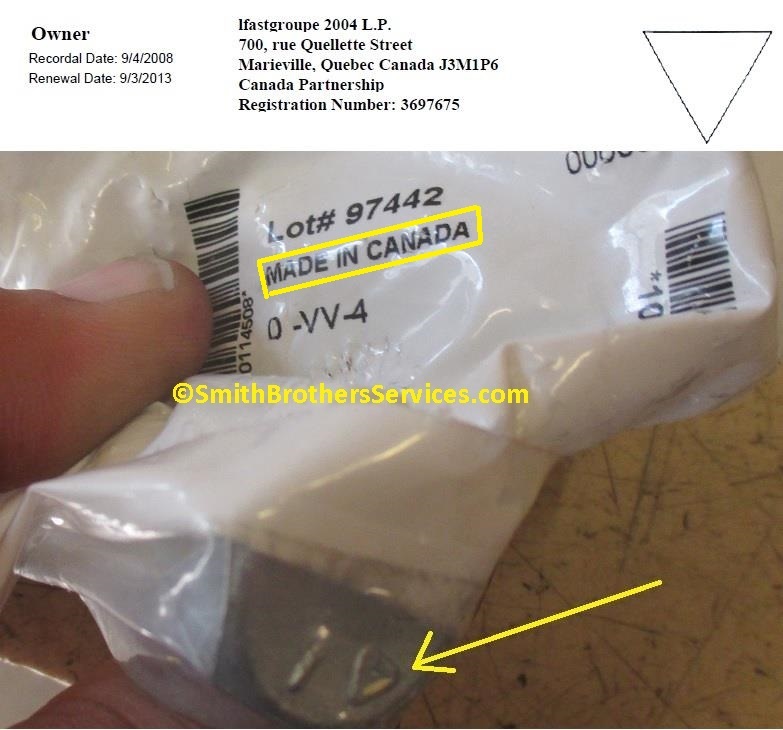 And finally since I know people are coming here because they do not know what the lines on the heads of bolts mean, here is an example of two bolts Made in Canada. One is Grade 5, and one is Grade 8. The color (coating) does not matter. Grade 5 has 3 lines on the head, and Grade 8 has 6 lines on the head. Since we sell and install Meyer Snow Plows, we stock our bins with what we use. Maybe it is what you are looking for? We have an online store, and we ship daily. Because plows require larger hardware, that is what we stock. Just about every brand of commercial plow on the market today uses 1/2", 5/8" and 3/4" hardware on the plows themselves and to attach the plow mounts to the vehicles, so that is what we stock and offer. Because something has to give, plows use Grade 5 hardware to attach to vehicles. Plow manufacturers WANT the bolts to shear to protect the vehicle. So don't go all gung ho and use Grade 8 if you are installing a plow! Better to shear a bolt than to shift a frame rail. there has to be a weak link somewhere. Maybe you would rather find out the hard way, as in after a hard hit your door will no longer open! No joke, I have seen it. Bolt 1/2-13 x 1-3/4” Grade 5. Fully threaded. Made in Canada. Bolt 1/2-13 x 1.5" Grade 5 (CANADA). Zinc Plated. Bolt 1/2-13 x 2" Grade 5 (CANADA). Zinc Plated. Bolt 1/2-13 x 2-1/2" Grade 5 (CANADA). Zinc Plated. Bolt 1/2-13 x 2-1/4" Grade 5 (CANADA). Zinc Plated. Bolt 1/2-13 x 3" Grade 5 (CANADA). Zinc Plated. Bolt 1/2-13 x 3-1/2" Grade 5 (CANADA). Zinc Plated. Bolt 1/2-13 x 3-1/4" Grade 5 (CANADA). Zinc Plated. Bolt 1/2-13 x 4" Grade 5 (CANADA). Zinc Plated. Bolt 1/2-13 x 4-1/2" Grade 5 (CANADA). Zinc Plated.